California’s AB 1634 requires all dogs and cats to be neutered by six months of age unless owners obtain expensive veterinary exemptions, business licenses (if properly zoned) or pay exorbitant fees to preserve an intact dog or cat for exhibition. The Cat Fancier’s Assoc. (CFA) had a major hand in bringing about what at worst may be only a delay and at best, a battle won. Mounting a vigorous campaign through one of the bill’s major supporters, the California Veterinary Medical Association, CFA announced that CVMA is no longer a “Sponsor of the bill, nor a Supporter.” Loss of the CVMA political support did not go unnoticed by the CA Senate. The National Animal Interest Alliance's (NAIA) is one of the oldest and best organized legislative action organizations. One of AKC’s board members is the founder of NAIA but it was CFA which praised NAIA’s “hard work to organize and promote the list of opposed veterinarians on their website”. 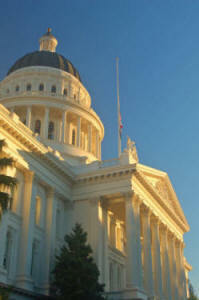 The California Veterinarians Against AB1634 registered a letter of opposition which was posted on the NAIA website. According to attorney and Legislative Specialist Cindy Cooke, the groups all worked hand in hand. See "CA Goose Cooked", Cindy lends her expertise to the United Kennel Club (UKC) which, as one of the oldest registries in America, reaches a huge population of hunters and “using dogs” owners who staunchly support the UKC’s “total dog” concept. The AKC Canine Legislation Department achieved interviews on Fox and CNN as well as coverage in USA Today. Many regret that it took so long to stall the bill, because as one dog owner pointed out, “had media efforts and costs been combined, voters in every state would know of the imminent threat to their rights as dog and cat owners.” Dog food companies run endearing commercials but given the serious impact a bill such as CA 1634 would have on every segment of the pet industry, many wonder why they failed to sponsor voter awareness commercials. Most pet owners have no idea what’s headed their way until, like citizens in Denver, their beloved dogs are seized and impounded based on breed resemblance. In other cities, fees and restrictions become so outrageous that families suddenly find they can not afford to own a dog or cat. The AKC vows to “keep clubs, delegates, breeders, exhibitors, judges, handlers and owners of dogs informed of pending canine legislation issues.” AKC requests non-tax deductible donations for its Canine Legislation Department. There are however, many local and national groups that keep the average PET OWNER informed about intrusive legislation. Some of those may qualify for tax-deductible donations. Most national “humane” organizations do NOT oppose mandatory spay-neuter or high owner-fees. In fact the reverse is true. Some “animal rights” groups actually favor the extinction of all ownership claiming it would eliminate cruelty and alluding to the purported overpopulation of dogs and cats! Resolve these questions when deciding who to support. Do you choose organizations that support YOU or those that would legislatively take away your inherent right to own or breed companion animals? Does it operate under the guise of a sheltering organization but maintain no shelter operation. Check it out before you make out the check! Above all, stay informed on local and state issues that affect pet ownership. Assemblyman Levine may have been spanked but he’s no fool and if as alleged, he has the three A’s behind him – Animal Rights Agenda – he isn’t done with animal owners! CA AB1634 is like the monster in a horror movie. It isn’t dead. It will be back in the next scene.